eX Podcast: Ep. 72: How can organizations prepare for the future of work? 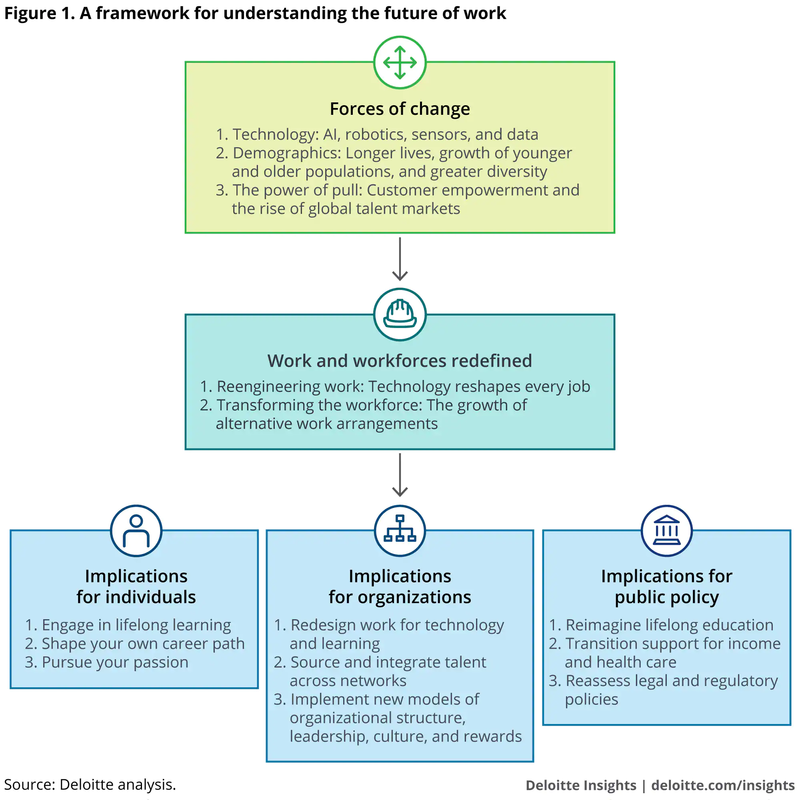 What does the future of work look like, and what are the implications for individuals, organizational leaders, and educational institutions? There’s been a lot of talk, buzz and hype around the impact Millennials have had on organizational models and how to shape company cultures. Organizations have been forced to adapt to new paradigms for centuries. You can’t blame Millennials for disrupting the workplace. Disruption in the workplace happens all the time: industrial revolution, Henry Ford’s standardization model, recessions resulting in massive unemployment, economic booms resulting in a shortage of talent, AI/IoT/automation, etc. The common pattern is that you see companies that disappear because they can’t adapt to change, companies that barely survive by following the herd reactively, companies that proactively anticipate a new paradigm and prepare for it, and companies that completely disrupt their industry by introducing a new business model. It always starts and ends with Leadership’s bold (or lack of) vision, flexible mindset and the ability to see change as an opportunity (not a threat) to reinvent itself. Deloitte is no stranger to change. The forward-thinking company has reinvented itself multiple times: business model, organizational structure, service offering. They continuously implement change internally before implementing it externally with their customers. Dr. Kelly Monahan is a manager and subject matter specialist at Deloitte’s Center for Integrated Research. Her research focuses on the intersections of behavioral economics and talent issues within organizations. Her research has been recognized and published in both applied and academic journals, including MIT Sloan Management Review and Journal of Strategic Management. - The main question we need to ask ourselves when we think about the future of work: ‘the future of work to what end?’. - The new contractual expectations between an employer and an employee when it comes to the future of work. - The shift from a cost-reduction to a consumer brand mindset in order to create the workplace of tomorrow. - Should we fear or should we embrace new technologies such as AI and IoT to shape tomorrow’s workplace? - How our education system must evolve to prepare our children for the future of work. - What will be the skills required to succeed in the future workplace. Note: you can follow Kelly on LinkedIn, Twitter, Deloitte Insights, and Deloitte on LinkedIn, Twitter, Facebook.